London is one of the most ethnically diverse cities in the world. In Hackney alone, it’s estimated 89 different languages are spoken. At Fix, we believe in making the therapeutic benefits of yoga accessible for everyone. We are introducing a Women's Only Yoga class to create a space where women can exercise with privacy, comfort and modesty. The class will be open to all women and is suitable for all levels from beginner to advanced. How does yoga sit with religious faith? Many people question whether yoga is compatible with having another faith, be it Muslim, Christian or Jewish. Although yoga shares historical roots with Buddhism and Hinduism, the modern practice of yoga is not inherently a religious activity. Yoga is an umbrella term that encompasses many different forms, some of which are more spiritual than others, for example Bhakti yoga is the practice of devotion. Even when the practice is spiritual, it does not specify a religious faith, and there are many groups around the world that have woven the practice of yoga into their own religious faith, for example, PraiseMoves and Jewish Yoga Network. What is the Fix approach to yoga? At Fix, our goal is to share the therapeutic benefits of yoga in a way that is safe, accessible and inclusive. The classes are kept small to make sure you get individual attention and are supported in your practice. Our classes use physical poses (asana), breath techniques (pranayama) and body awareness to develop strength, flexibility and balance. The practice also helps to bring stillness and calm to our busy minds through relaxation and mindfulness. It is the kind of therapy we can all benefit from, whatever your belief system. Bryony has a background as a doctor and is training to be a yoga therapist with the Minded Institute. Since being diagnosed with Type 1 diabetes and becoming a mum of 2, she has learnt to adapt her yoga practice to the changing demands of her life. In her teaching, she brings a deep understanding of how the body works as well as a sensitivity to individual needs. When you’re sad, where do you feel it? When you’re anxious where does it manifest in your body? When we go through something that is a stressor for us, be it deadlines, family issues, mental health problems or simply a crap day, we can feel it in our body. You might read this and be thinking “uh.. no I don’t”, but we rarely stop in those moments and think “this moment is stressful, I can feel a tightening in my stomach and a seizing in my breath”. Those moments of “fight or flight” are a relic of times when we had to run away from a predator to protect ourselves, as useful as they were then they are (mostly) useless now. So going back to times when we feel stress, let’s say at work. Perhaps you have a stressful journey to work crammed on the tube; your boss pushing for more paperwork on top of deadlines; it may be an important meeting you don’t feel ready for, or shameful feelings because you cannot stay on top of your workload. This list can be endless and cyclical. With each of these stressors prompting emotional reactions, which then translate into our body, it’s no wonder we can end up so “clam-like”, as one of my clients put it. These days can stack up into weeks, months and years of deepening the groove of stressful cycles and, like limescale in the shower, it builds up in the body. This build up can develop into postural problems, chronic pain etc, in return we get stressed and upset about this pain as it impairs our movement and day-to-day life, deepening our stressful cycle even more! With all of that said there are ways to break this cycle; having a treatment, doing yoga, cardio or even meditation brings us back to the body, we can begin to soothe our over-stimulated nervous system. We bring in a sense of space and perspective to all the zipping thoughts and emotions whilst also allowing those tightened areas in our body to soften and “let go” of the need to be prepped and ready for “running away”. It’s all too often in treatments that clients find themselves overwhelmed with emotion and may begin to cry when a lot of muscular release is happening. I try to welcome this reaction for the clients as a way to say to themselves “okay...I have to take care of myself”, it’s nothing to ashamed of but a gentle invitation to turn towards more self care. Self care is not a luxury, especially not in the rush of the modern world. Acupuncturist Cristina Betto talks about her work, her inspirations and what she wishes people knew about acupuncture. 15 years ago I was experiencing frequent sinus infections accompanied with a persistent blocked nose. Nothing helped and nasal sprays were causing more damage; nose bleeds, nasal irritation etc. Running out of options and feeling hopeless, I turned to Acupuncture. After just 5 weeks of regular treatments I cured and my sinuses have never bothered me again! Following this transformative experience, I carried on getting regular Acupuncture as I found that my stress levels reduced enormously! At that time I was working as a TV Producer and running a few productions at once with crazy deadlines. I realized how much Acupuncture was helping to keep me calm and how much it improved my sleeping pattern. My fascination for Chinese Medicine grew and I decided to quit my life long profession in television to embark in a degree in Acupuncture. What, today, keeps you excited about Acupuncture? Acupuncture is a lifetime of learning, an ongoing journey that is constantly changing. I’ve done multiple advanced trainings over the years that keep my knowledge fresh and up to date. Most recently, I’ve been incorporating a new technique call Motor Point Acupuncture. More than anything, I love connecting with people. Each person is so unique, with individual experiences, struggles and goals. I believe it’s incredibly important to listen to each patient to develop trust and honest communication and help guide them through their healing process. I want to help people feel empowered and give them information, so that they can make educated choices about how they manage their health and well being on their own terms. I find when people begin to feel improvement, they then begin to feel hope for a new reality and there’s a momentum that develops when someone feels hopeful! Hope keeps people motivated to continue treatments and this hold huge potential for deep, long term healing. How does Eastern medicine philosophy differ from Western medicine? I find that western medicine focuses on treating the symptoms without addressing the root cause of the issue. Needles intimidate a lot of people, what would you say to people who may be feeling nervous? The fear of needles is one of the biggest hurdles acupuncturists strive to help their clients overcome. Some people are nervous around needles; I never push anyone into using them unless they feel comfortable, confident and ready to do so. However, acupuncture needles are ultra thin compared to hypodermic needles, which makes for a completely different experience. I take great care in needling gently and quickly. Once the needles are in clients may experience what we call a ‘di qi sensation’ – a feeling of fullness, distention, tingling, warmth or movement around the needles. It can be a little surprising the first time someone feels it but that sensation is one of the indicators that the needling is doing it’s job. What if I don’t have any health problems, can Acupuncture enhance my health or prevent future problems? Yes! Acupuncture has traditionally been used as a preventative medicine. Recent research has now verified that Acupuncture stimulates immune function, which increases resistance to bacterial and viral infections. Acupuncture can dramatically increase overall vitality and energy. It treats underlying causes, resulting in a deeper kind of healing. It brings about profound changes in people’s lives on an emotional level as well as physical. What is one myth about Acupuncture you wish would go away? I wish that people understood that Acupuncture isn’t just ‘hocus pocus’ or just a placebo. In fact, it is a scientific based medicine with a history of more than 2000 years. Research into Acupuncture as a medical treatment has grown exponentially in the past 20 years, increasing at twice the rate of research into conventional biomedicine. A wide variety of clinical areas have been studies, including pain, cancer, pregnancy, mood disorders, strokes, sleep disorders and inflammation to name a few and many of those studies have shown Acupuncture’s effectiveness in the hands of a well-trained practitioner. Can you give us some tips on how to get the most from Acupuncture treatments? I would start by making a list of all your symptoms and major life events before coming into your appointment. The more information you can give your practitioner upfront, the better they can tailor the treatment to your needs. Turn off technology! Your treatment time is one of the only moments you get to shut the world out and focus on yourself. Avoid caffeine and alcohol before and after your treatment. And get regular treatments. Some issues respond more noticeably to weekly treatments. Other times you might only need to go once every month or so for a ‘tune up’. Cecile Dumont, massage therapist at Fix London Fields, on what Myofascial release is and how it can make space for healing in the body. To ask how the mind communicates with the body, or how the body communicates with the mind assumes that the two are separate entities. Mind-body awareness are two sides of the same coin, inseparable, connected, and communicating constantly. John F. Barnes has spent the last 50 years developing Myofascial Release (MFR), a deep and intuitive form of body work. At its core, the belief that the therapist needs to treat a whole person and not just symptoms. MFR eliminates pain and restores motion through the release of myofascial restrictions. It allows its recipient to return to a state of connection, balance and freedom of movement. But what is fascia, and how does MFR work exactly ? Fascia is unlike any other system in our body – it is a three-dimensional network of connective tissue that spreads throughout the entire body. A liquid crystalline matrix made of elastin and collagen, it has the ability to stretch and move without restrictions. It surrounds and attaches every muscle, bone, nerve, artery, vein and organ. If you’re having trouble picturing it, think of a body suit made of spider web! And it is the new rage in the medical world. Ignored for a long time and discarded as this white layer of fuzz underneath the skin, it is now thought to be a direct extension of the brain. Some of the latest research has referred to it as a new organ. Some go as far as saying it might be the seat of the subconscious. So what of myofascia? Myo means muscle. Myofascia is therefore the fascia that interpenetrates and connects muscles. It determines the length and functions of each muscle in the body. Fascia is liquid by nature but when the body goes through any trauma, inflammation or surgical procedures, the myofascia loses its pliability, tenses up, and solidifies - or rather becomes more gel-like - therefore limiting movement and creating pain patterns. Unravelling these patterns and restoring a mind-body balance is what Myofascial Release does. Barnes defines Myofascial Release as “the three-dimensional application of sustained pressure and movement into the fascial system in order to eliminate fascial restrictions and facilitate the emergence of emotional patterns and belief systems that are no longer relevant or are impeding progress“. In simpler terms, MFR is a deep, gentle and non-invasive application of pressure into the restricted tissues. The combination of time and sustained pressure encourages the elongation of the viscous tissues and the fascia goes back to its more fluid state, which in turn allows the tissues to lengthen and free up movement. The recipient can feel the myofascia move like butter melting or taffy stretching, and the therapist is then guided to the next area of restriction. In MFR, the therapist very much acts as a facilitator – it isn’t the therapist actively moving the tissues, it is the tissues moving themselves and therefore the therapist. MFR is done without any oil or wax, directly skin on skin, and without a towel – the therapist needs to see the whole body at all times as it will give signs of where restrictions can be found (usually through a vasodilation response where tissues turn red and hot or through movement). The recipient is therefore encouraged to come in shorts or underwear they’ll be comfortable moving in. Why movement will you ask ? As the myofascia goes back to a more fluid state, elongates and moves the tissues around, the body might need to move itself to help facilitate this release. This phenomenon is called unwinding, and it is a recommended and necessary part of the treatment. It is natural for the body to want to move, twitch or shake as the release happens as it is likely that it was in motion when the trauma occurred and created the restriction patterns. In order to get a full release, the body often needs to move itself through similar movements. Unwinding is an enlightened movement that will only occur when the recipient feels safe to let go and allow the release of the trauma pattern trapped within the fascial network. Which brings us back to the mind-body connection. You will have understood it by now, Myofascial Release is a different approach to body work. It requires the recipient to be present in their body to feel and experience this waking up or healing process. Every session is a journey where the recipient has to be willing - without judgement or analysis - to connect and let go, to take the brakes off and to let their body heal itself through the release of long held emotions or patterns of movement that contributed to creating pain. This is intuitive work achieved through connecting to the proprioceptive senses of the creative and instinctive right side of the brain, not the analytical and logical left. The recipient is invited to use their breathing and intuitive focus to soften and connect with their body and its pain patterns. And the cause of the pain is likely to be elsewhere. Which is why in MFR the therapist looks at and treats the whole person, not just the symptoms. Through hands on work (and hands on work only), the therapist facilitates a return to a better mind-body balance. But this cannot happen without the recipient fully embracing the capacity that their body has to heal itself. Resilience – your body feels, and feeling is healing. Karin Hilfiker, Physiotherapist at Fix London Fields, on why sleep is so important and how to get some good shut eye. Who doesn’t love sleep? What doesn’t feel more glorious than climbing into bed after a long day? That said, many of us don’t get the amount of sleep we need. Did you know that more and better sleep can not only increase concentration, enhance motor performance and mood, it can also help prevent or reduce persistent pain? (1). There are several possible mechanisms of how this might happen including changes in dopamine and opioid levels in the brains as well as reduced inflammation and changes in neuroendocrine levels. 1. Getting enough sleep: the average person needs between 7-9 hours of sleep per night, athletes in training likely need a bit more. If you are getting much less than the recommended amount, start small and just try turning off the lights a half hour earlier each night. 2. Going to bed and waking at the same time each day helps normalize your circadian rhythm and can help you fall asleep faster when you get in bed. 3. Establish a night time routine: dim the lights, drink a cup of caffeine-free tea, take a warm shower or listen to soft music. Meditation or a gentle yoga practice can help relax your body and your mid. 4. Create your Cave: your sleeping area should be quiet, cool and dark. Optimal room temperature is 16-18 degrees centigrade. Use blackout blinds, eye mask, or ear plugs if you need to. Ideally avoid using your bedroom to work, watch television or eat before sleeping. 5. If you cannot sleep within 15 minutes, get out of bed and try performing a mundane task. Don’t work or watch TV as this might be too stimulatory. Similarly, if you regularly wake during the night and have a hard time falling back to sleep, go to another room and read or do other quiet activities until you feel sleepy. 6. Avoid coffee, alcohol and nicotine in the hours before bed. Some people are very sensitive to caffeine and should avoid caffeine after 12pm. 1. Finan PH, Goodin BR, Smith MT. The association of sleep and pain: an update and a path forward. J Pain. 2013;14(12):1539-52. 4. Lovato, N, Lack, L. The effects of napping on cognitive functioning. In: Gerard A.Kerkhof and Hans P.A. van Dongen, editors: Human Sleep and Cognition, Vol 185, Oxford: Elsevier Science; 2010, p. 155-166. Have you had enough of the tablets and nasal sprays and you want something more natural as a treatment ? Despite its name, hay fever is seldom caused by hay and this medical condition does not lead to an elevation in body temperature. The term “hay fever” was originated in England in the early 1800s when doctors noticed that some rural residents experienced sneezing, itchy eyes and coughing after being exposed to cut hay or grass. Hay fever, also known as seasonal rhinitis, is an allergic reaction to pollen and therefore is common in spring and summer. Typical symptoms include itchy eyes, blocked or runny nose, sneezing, watery, red eyes, blocked sinuses and tiredness. However, while grass pollen is the most common (May to July), there are pollens specific to trees (February to June) and weeds (June to September) which can also cause the allergic reaction. While this disease is not life-threatening, it is definitely life-altering and, if left uncontrolled, allergic rhinitis can seriously impair a person’s quality of life. According to Allergy UK, allergic rhinitis is the most common form of non-infectious rhinitis affecting between 10% and 30% of all adults and as many as 40% of children (https://www.allergyuk.org/information-and-advice/statistics). In looking at alternative remedies, studies suggest that acupuncture can help with symptoms of hay fever (https://www.ncbi.nlm.nih.gov/pubmed/23420231). From a Chinese Medicine perspective hay fever is seen as an inability to produce enough energy for a healthy immune response to wind and allergens. When the immune system is depleted through poor diet, worry, stress and lack of exercise, it cannot produce enough protective energy (wei qi) which is important to defend against outside wind and pollen. Without healthy wei qi, wind penetrates the body to produce hay fever symptoms such as sneezing, itchy eyes, coughing, running nose etc. Acupuncture works to balance the body, helping it stay strong and resilient. By inserting fine needles just below the surface of the skin, a reaction is triggered to promote homeostasis. In addition to promoting a calmer nervous system, acupuncture points are chosen to address symptoms as they present, so, in peak allergy season we work on unblocking noses and clearing out lungs. Better yet, prior to allergy season we try to create a stronger healthier respiratory function so when the pollen count gets high, the body can handle it better. With hay fever season just around the corner it is important to get in front of it and start making the changes now. Perhaps, instead of deciding which cocktail of medicines will be taken this year, a course of acupuncture should also be something to consider. Fix has acupuncturists at both our London Fields and East Village clinics. Click here to book in with them. Nick Warner, Physiotherapist, talks about the importance of progressive loading for injury recovery, strength and a well-functioning body. This brings us on to the topic of progressive overload, the science of getting change right. Overload is a training principle used in exercise in order to allow for adaptations in our muscles. We can see these adaptations as increases in strength, power and endurance, for example. When we perform a certain exercise above or beyond what we have has done before, our body will undergo physiological changes to enable us to complete that exercise with greater ease and efficiency. If we continue to work at the same intensity of that exercise, we will soon reach a plateau, where that movement or exercise no longer stresses the body and further improvements will stop! By making our exercise harder, or increasing the workload on the muscles, we can then again induce these adaptations, which then allows for further progression. Post injury, we can often find ourselves lacking strength in certain muscles groups. This can be due to lack of mobility and altered mechanics due to pain, decreased training loads due to injury and pain inhibition of certain muscles. Therefore, on the road to recovery, overload can be used to safely return to movement and is critical to return these muscles to optimum function, with decreases in pain and lower risk of re-injury. In order to safely achieve progressive overload, without overtraining or running the risk of increasing the risk of injury, it is important not to rush. You don’t need to try and do more every time you exercise! Unfortunately there is no magic number on how much or when to overload. Small increments can be made weekly if manageable without any increases in pain or soreness. When increases are made, it’s fundamental that you are able to complete that exercise with the same technique. Give yourself time, stay consistent and happy loading! Alice thomas, team GB TRIATHLETE AND Fix Strength and Conditioning Coach, talks about the importance of strength and conditioning for boosting performance and injury prevention. Let’s be honest, Strength and Conditioning (S&C) is all too often the training session that first gets dropped or overlooked by many sports people, not least triathletes. However, the evidence is pretty overwhelming that regular S&C forms vital part of any successful training programme. The musculoskeletal system provides form, support, stability, and movement to the body. Strengthening this system as a triathlete is key. S&C will improve your performance and lessen your chance of injury. SO WHAT IS STRENGTH & CONDITIONING, AND WHY IS IT SO IMPORTANT FOR ATHLETES? The two elements of S&C work hand in hand to maxmise your potential. Strength training boosts the power and endurance of muscle groups to boost your performance. Whilst the conditioning element might be said to focus a little more on the mobility to key joints, on the fluidity and timing of movements to improve efficiency, and to minimise muscular imbalances and weaknesses to help avoid injury. Swimming, cycling and running use repetitive movements over long periods of time creating load on muscles, tendons, ligaments and joints. If there are weaknesses or imbalances in your body this can cause other more dominant muscles to become over worked, often leading to injury. Often the site of pain may not be the root cause of the problem, which is why at times its essential to work with a team to fully understand the context of your pain. Good quality S&C has exercises and movements that are specific to the movements in your sport and tailored to your training level and goals. This type of focussed conditioning work is sometimes called functional training. I'd recommend any athlete to have a good quality, coach-led S&C weekly session all year round. It's about focussing on flexibility, mobility, plyometrics (practising explosiveness movements of the muscles), balance and more. It's also important to remember that a S&C plan needs to be specific to the individual and that having someone lead the session can really help you understand key areas for you to focus on. Some reasons why S&C should be incorporated into your weekly training plan. Improve triathlon performance - efficiency in all 3 disciplines. Injury prevention - S&C can help to avoid overuse of muscles by minimising imbalances in the body, and smoothing out imbalances in muscle activation. Improve muscle recruitment for when you need it during races. Creating a strong but dynamic inner support system (or ‘core’) will stabilise the body and maintain a good posture, on the bike in the water as well as running. Having weaknesses & imbalances in your body can lead to a decreased power production in the legs, overuse of injury, poor posture and muscular imbalances. Improving joint range of motion, and power through range, allows you to maximise you muscles when you need them. Foam rolling before rides and runs can help with soft tissue restrictions and boost blood flow. There are many exercises and this list isn't exhaustive. Check out this article on S&C I wrote for Liv Cycling and Bike Radar for some fuller examples. Squat - Ideal to work on those glutes. Often cyclists have relatively weaker glutes, and bias their hamstrings and quads. This exercise helps to protect the back and knee joints by building strong glutes. Box Jumps - works on explosive power through the legs and core - great for giving you that kick when you need it. Kettlebell exercises, these dynamic loaded compound movements are fantastic (when coached correctly and safely) for working large numbers of muscle groups. I’m really thrilled to have joined the team at Fix and to be able to offer focussed sport-specific S&C in their new Studio in London Fields. Come and give it a go! Q&A with Karin - Physio and dancing. Do find that physio for dancers is unique when compared with treating other movement disciplines? More than many other kinds of athletics, dance training emphasizes quality of movement and as a result dancer generally have incredible body awareness. Sleep tight - Sleep Awareness Week March 11th - 18th. So many people we see in clinic struggle with the effects of poor sleep. So, in aid of National Sleep Awareness Week this week, our Nutritional Therapist Nuria talks about why a good sleep is so important and how you can go about getting one! 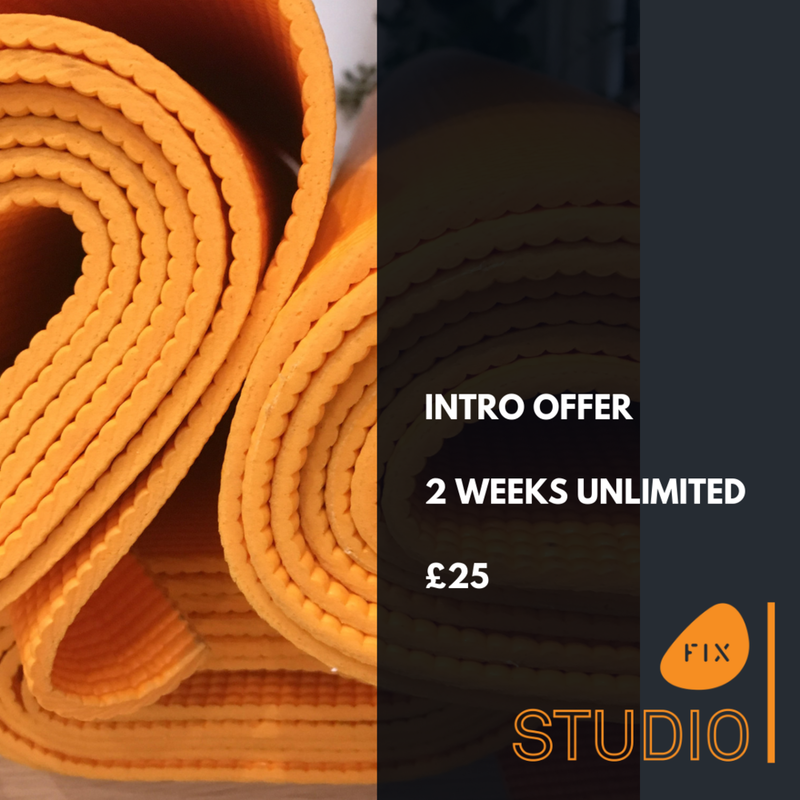 HYPNOBIRTHING @ FIX SPRING OFFER! Receive £45 off of any full Hypnobirthing Group Course booked and paid for by the 10th March! Valid for any group course and including all materials, for yourself and your birth partner. Time to spread the love at FIX with a week of discounted massage at our East Village clinic. Whether is a gift for your sweetie or a self-care treat, we're taking 30% off 60 minute massages for E20 residents throughout Valentine's Week. What's not to fall in love with?